The "vintage Kent State" sweatshirt is for sale in the women's section of the Urban Outfitters' website. The sweatshirt description reads: "Washed soft and perfectly broken in, this vintage Kent State sweatshirt is cut in a loose, slouchy fit. Excellent vintage condition. We only have one, so get it or regret it!" On May 4, 1970, four students were killed and nine other people were wounded on the Ohio university campus after an Army National Guard Unit fired on students protesting the Vietnam War. In response to the incident, Neil Young composed the song "Ohio," which was performed by his band Crosby, Stills, Nash & Young. 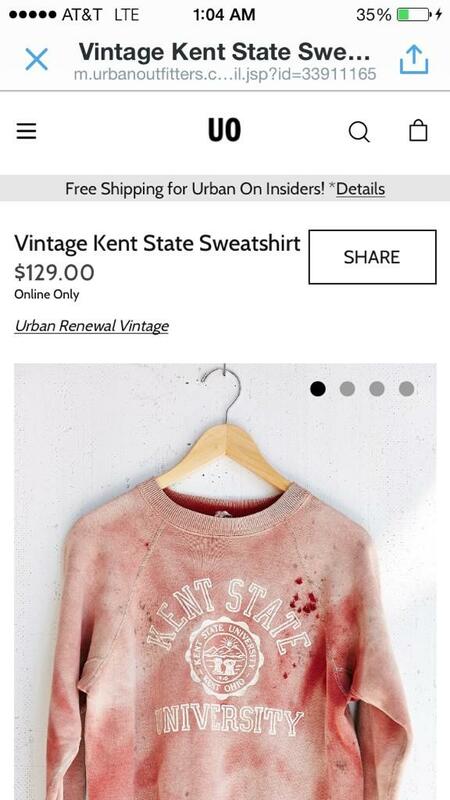 Urban Outfitters are selling a &ldquo;vintage&rdquo; Kent State jumper, blood splatters and all. Nothing says &ldquo;hip&rdquo; like murder. 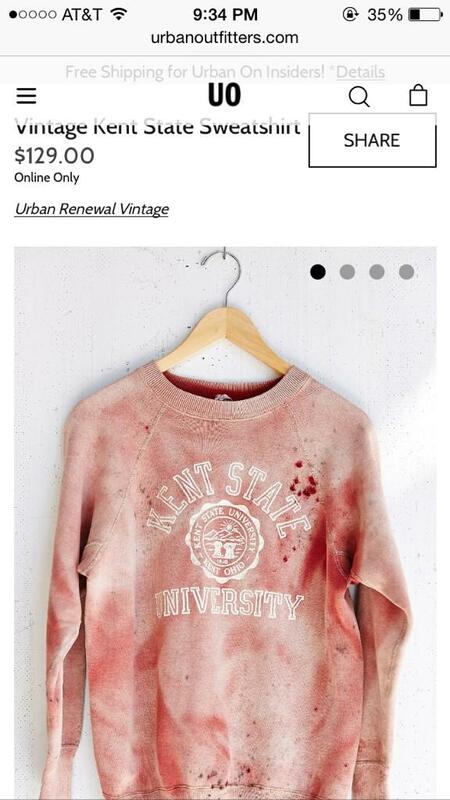 Urban Outfitters are selling a â€œvintageâ€ Kent State jumper, blood splatters and all. Nothing says â€œhipâ€ like murder. Urban Outfitters has pulled clothing and other products in the past after receiving criticism for offensive content. Update — Sept. 15, 2:15 a.m. ET: The Urban Outfitters website now says the sweatshirt is sold out. Update — Sept. 15 10:13 a.m. ET: Urban Outfitters apologized for "any offense" the sweatshirt caused. The company said it had not been "altered in any way." The stains, it said, were due to "discoloration" and the holes are from "natural wear and fray." We invite the leaders of this company as well as anyone who invested in this item to tour our May 4 Visitors Center, which opened two year ago, to gain perspective on what happened 44 years ago and apply its meaning to the future.